If you are worried about your vision or the condition of your eyes, do contact us to arrange an eye examination. With regular eye check-ups, many problems are caught at the early stages and if caught early are easier to treat and can minimize damage to your sight or eye health. Amblyopia – also known as “lazy eye”, is a condition that occurs usually in childhood when the vision in one eye does not develop properly. If left untreated, Amblyopia can lead to a permanent loss of vision in the affected eye. Lazy eye can usually be treated successfully as long as it is diagnosed early enough. The underlying problem causing the lazy eye is corrected first. That might be by wearing glasses to correct a squint. The child then is encouraged to start using the affected eye again. This is typically done by wearing an eye patch over the stronger eye or by using eye drops to temporarily impair the vision in the stronger eye. Regular eye tests for children with an optician are very important in picking up this condition early so that it can be treated effectively. Astigmatism is a very common but usually minor condition caused by an irregular-shaped cornea or lens. Astigmatism can go undiagnosed for years. And it can affect ability to read and concentrate. This underlines the importance of regular eye tests with the optician for you and especially for young children. The condition is generally mild and so does not require treatment beyond prescription of corrective glasses. “Toric” contact lenses suitable for astigmatism are also available nowadays for people who prefer contact lenses to spectacles. In some – more severe – cases, corrective laser surgery may be appropriate. The condition is very common and often keeps coming back. Blepharitis is not usually serious, but it causes discomfort and prevents wearing of contact lenses while experiencing symptoms. There is no cure as such for Blepharitis. But the symptoms should be controlled through a systematic daily eye-cleaning routine. More severe cases may require antibiotics. A cataract is a clouding of the part of your eye called the lens. This is a very common condition as we get older, and can occur in one or both eyes. Cataracts are usually painless, but they lead to a gradual worsening of your sight. As the condition worsens, your vision typically gets more clouded and becomes like looking through a frosted window. We strongly recommend that you have your eyes tested every two years. Cataracts are sometimes diagnosed during a routine eye test, even if you are aware of no symptoms. The recommended treatment for cataracts is generally surgical removal of the cloudy lens and replacement with a new plastic lens. This is a routine operation nowadays, and is normally carried out under local anaesthetic. Colour blindness – more correctly referred to as “colour vision deficiency” – is a very variable condition. Individual sufferers have difficulty with recognising different sets of colours on the spectrum. And the severity ranges from experiencing only slight difference in your appreciation of different hues, through to almost total inability to differentiate colours. This condition occurs more often in men, affecting around 1 in 20 in the UK. It is much less common in women, affecting only 1 in 200. Total colour-blindness (i.e. seeing only shades of grey), however, is extremely rare. People are not always aware that they suffer from mild colour vision deficiency. We strongly recommend having your eyes tested by your optician at least every 2 years. If you have any concerns at all about your colour perception, make sure you ask for an eye examination that includes a test for colour vision. Conjunctivitis – a very common condition – is a redness and inflammation of the thin layer of tissue that covers the front of the eye (the conjunctiva). Depending on the cause of the problem, other symptoms can include itchiness and watering of the eyes, and occasionally a sticky coating on the eyelashes. Symptoms usually clear up within a week or two, so treatment isn’t generally needed. Sometimes, it may be appropriate to be prescribed antibiotic eye drops to clear up the infection. Depending on the type and cause of the conjunctivitis, the condition is normally resolved by eliminating contact with the irritant, by maintaining good hygiene, or through the body’s natural defense mechanisms against viruses. The condition can be infectious. But you don’t usually need to stay off work or school so long as you pay attention to hygiene in order to reduce the risk of spreading the infection. You should not wear contact lenses until the symptoms have disappeared. Diabetic retinopathy occurs when high blood sugar levels cause damage to the cells of the retina at the back of your eye. The condition will worsen without appropriate treatment or management and can ultimately lead to blindness. The NHS operates a diabetic screening programme, so it is important that you attend your regular medical check-ups if you have been diagnosed with diabetes. Any steps you take to manage your diabetes effectively (blood sugar levels, exercise, weight, etc.) will help to control and limit the severity of eye-related complications, or at least to slow the rate of progression. Undiagnosed diabetic retinopathy can often be spotted by your optician during routine eye checks. So it is very important – especially as you get older and if you have risk factors for diabetes – to get your eyes checked regularly and at least every two years. We always recommend opting for a retinal photograph to be taken during the check where that service is available. 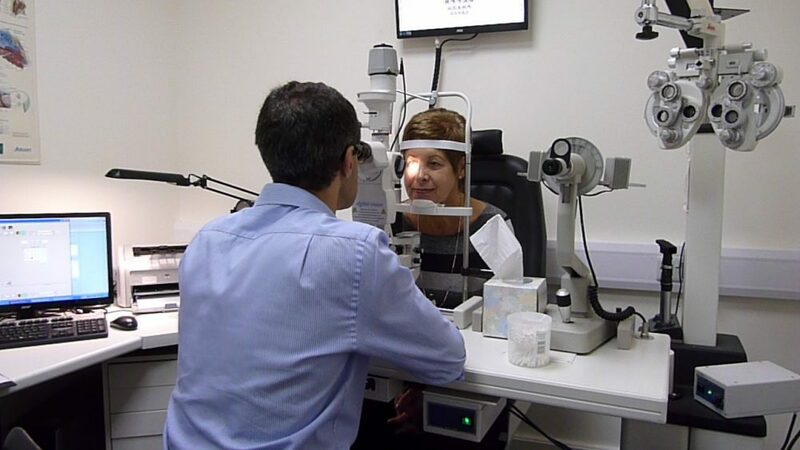 Some of our opticians provide specialised services for diabetes-related eye conditions. Mild diabetic retinopathy may not require any treatment so long as you maintain good control over your risk factors – including blood pressure, blood sugar, and cholesterol levels. In more severe cases, the normal treatment is laser surgery. This cannot restore parts of your sight that have been lost due to damage on your retina. But it can be effective in blocking further deterioration. Though it is more common in women and people aged 65 and over, dry eyes can affect anyone. It can be caused by environmental factors, such as exposure to the sun or wind causing the tears to evaporate, and certain activities such as prolonged reading or working on a computer. The ageing process can result in fewer tears being made and women may also find that changes in hormone levels during the menopause, pregnancy or while using the contraceptive pill can increase the risk of dry eye syndrome. Dry eyes can also be a symptom of a more general disease, such as rheumatoid arthritis, systemic lupus erythematosus (SLE), and Sjögren’s syndrome. In these situations you would normally have symptoms in other parts of the body. There is no cure for dry eye syndrome but there are simple treatments to help control the symptoms. Eye drops and gels can be used as artificial tears and are usually good at relieving symptoms. Ointments can also be used to lubricate the eyes and soothe the irritation. “Floaters” are small particles floating in the vitreous humour – the jelly-like fluid that fills the eye. If you have floaters, they appear as spots, wisps, or strands or other shapes that appear to be floating in your field of vision. The “floater” is actually the shadow that the particle casts on the retina. Floaters are quite common, especially in people with myopia (short sightedness) and as you get older. They can also become more noticeable when you are tired. Although they can be annoying and distracting, they are not harmful and do not require treatment. However, floaters can sometimes indicate a tearing or detachment of the retina. Such cases are often accompanied by “flashing lights”. If you notice a sudden increase in the severity of floaters or if you are seeing flashes, it is important to get yourself checked-out promptly by an optician. It is important to have your eyes checked regularly by an optician- at least once every two years. Floaters rarely require treatment. But a retinal detachment or tear will need surgery. Under certain circumstances – and if floaters are causing you significant difficulty – a vitrectomy may be performed. This is a surgical procedure to remove the vitreous humour in your eye together with the floating debris causing your floaters and to replace it with a saline solution. Glaucoma is a type of optic nerve damage that causes patchy loss of vision. It varies in severity from patient to patient. Without treatment, the loss of vision usually gets worse over time. Any loss of vision in glaucoma is permanent. But with early treatment, the damage to vision can be minimised. It is estimated that over 600,000 people in the UK have glaucoma, but only half are diagnosed. Compare the two pictures below for an example of how glaucoma can affect vision. Are you of African-Caribbean origin? If the answer is yes to any of these questions, then you are at increased risk and should definitely have your eyes tested regularly (at least every two years). Myopia (short sight) is a common eye condition that causes distant objects to appear blurred, while close objects can be seen clearly. It tends to happen in children and young teenagers and often runs in families. If distant objects appear fuzzy or if your child is finding it difficult to see things in the distance, you should make an appointment with an optician. A simple test will be used to help assess the vision. Hypermetropia (long sight) leads to problems with near vision and the eyes often become tired. It occurs when the eyeball is too short, the cornea is not curved enough, or the lens is not thick enough. It can affect people of any age but it tends to become more noticeable in people aged over 40. The main symptom is a difficulty with near vision, headaches and uncomfortable vision. Myopia can range from mild, where treatment may not be required, to severe, where a person’s vision is significantly affected. Both conditions can be corrected by glasses or contact lenses, or cured with laser eye surgery. This is a condition that naturally occurs with age. It causes vision to become blurred, making reading items close up difficult, which generally results in holding things further away to gain focus. It can lead to headaches and eye strain and the requirement for more light. The condition is due to the lens becoming more rigid. It usually starts around the age of 40 – 45 years of age. The sight can be improved and corrected by the use of prescription glasses or contact lenses. If symptoms are experienced, you should make an appointment to see your optician, who will examine your eyes to establish the right lenses to be prescribe for your sight requirements. Sjögren’s syndrome is a chronic disorder that causes insufficient moisture production in certain glands of the body. It most commonly causes dry eyes and mouth and occurs when a person’s normally protective immune system attacks and destroys moisture-producing glands, including salivary glands and tear glands. There is no known cause, but it is suspected that viral infections, hormones, genetics and stress are contributing factors. Nine out of ten people who have the disease are women and most first start noticing symptoms when they are in their 30s or 40s. There are two types, primary, when the condition develops by itself and not as the result of another condition, and secondary, when the condition develops in combination with another autoimmune condition, such as lupus or rheumatoid arthritis. There is no cure but it can be treated and controlled to help with the discomfort. The treatment will be tailored to meet the needs of the patient. Dry eyes can be treated with eye drops and gels and are usually good at relieving symptoms. Ointments can also be used to lubricate the eyes and soothe the irritation. Sjögren’s syndrome can affect different parts of the body, so once diagnosed the patient may be referred to different specialists. If you are concerned about your eye sight or currently experiencing problems then contact us now on tel: 01937 583278 or book an appointment today, because your eye health is important.